This year, we've got a whole bunch of Christmas-y stuff going on for children and adults alike. You'll find us handing out fliers in the coming weeks, you may even get one hand delivered through your door if you live in the streets around Balham. 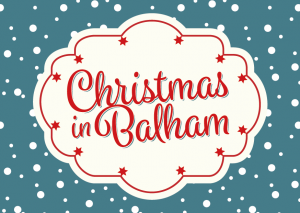 So, check out the list of events, get in the Christmas mood and come join us for some great Christmas fun and a chance to hear the good news about Jesus Christ that began at Christmas 2016 years ago. 4pm @ The Bedford, 77 Bedford Hill, SW12 9HD, upstairs in the Ballroom. Sing lively carols and enjoy the meaning and fun of Christmas using an orange and some sweets! 6pm & 8pm @ The Bedford, 77 Bedford Hill, SW12 9HD, upstairs in the Ballroom. Well known riffs & melodies mashed up with classic carols. Add a witty Christmas talk, some mulled wine & mince pies and there you have it … probably the best carol service ever! 10:30am @ Chestnut Grove School, Chestnut Grove. A chance for your kids to join in the fun of our Nativity play. 6:30pm @ The Bedford, 77 Bedford Hill, SW12 9HD, upstairs in the Ballroom. Come and sing along to some classic carols with our choir. 10:30am @ The Bedford, 77 Bedford Hill, SW12 9HD, upstairs in the Ballroom. Everyone welcome as the remnant of our church gather to wish a Happy Christmas.